Ciudad Food Avenue is home to 11 large restaurants serving a wide variety of dishes plus 17 food carts which serve refreshments, pika pika and light to heavy snacks. It its located along Diversion road, Batangas City. The first among the restaurants is the Cafe de Alps which actually is the first and currently the only bus cafe in Batangas. They serves rice meals, all-day American breakfasts and pasta. They are the only one that serves coffee, both hot and cold, inside CFA. The Java chips doesn't differ from the other cafe we've known. I love how they focus on its taste it doesn't have a lot chips together with the frappe. An all new pasta for me, this one is the Kaldereta pasta. It was with the idea that Batangas is well-known for its kaldereta taste and since Alps bus company originated from Batangas itself its a perfect invention to discover our very own. I didn't know that the taste will fit the pasta so I'm really shocked on how delicious it is. The Twins Wild Wings is the only one allowed to serve different chicken wings preparations among the customers. They have desserts which you'll surely love. They have platter which have chicken wings, sausage and nachos. They have different wings flavors depending on your choice and desserts! Trivia: Its homemade and its their very own recipe. I super love the mud pie. Its chocolate ice cream and the toppings was super good. Big Boned Restobar focuses its menu on back ribs steak but it gives it's dish a twist with its Batanguenyo fushion. They serves us this Spicy Kaldereta Ribs which has the true flavor of Batangas Kaldereta. I super love the spice and how soft the meat it can easily be deboned. Next is the Frozen Hub which is a true instagram-worthy place. Not only the interior itself but also the food that they serve. Gelato, drinks or even the pasta and other ala carte dishes they have. I personally loved the Unicorn drinks that has the secret ingredients to have glitters on it. You can have them on different flavors. Filipino resto shouldn't be absent here. The Arcat serves different "lutong-bahay" dishes that can satisfy ones' cravings. The seafood pancit isn't that fishy at all which I love, they made the buffalo chicken into a lollipop because other resto serves wings already. And the favorite of all, the sizzling brownies which I don't imagine at all but I think this can be their signature menu! Once the ice cream melts? Its the bomb! I've been to Pier 151 I think 4x already cause I love their seafood dishes that was full of flavor, plus they serves super fast! The resto has a unique set-up that will look like an actual ship. So I don't actually like raw foods and this is what they served us but my co-bloggers says that it taste really fresh tho. They also have the Singapore crab with a sauce of your choice, I prefer the spicy one. Bulls and Booze by its name they offer different type of steaks and drinks to booze its guest. Their signature dish which is the burger that is made with potato and banana patty taste really good and healthy. I love how they cook their fries, its not toasted and not undercook as well. TJ Sizzle Restobar is a container-truck design that offers Filipino favorite dishes into sizzling plates. (Top to Bottom) Bulalo, Crispy Bituka ng Manok, Kare-Kare and Sisig were one of those. They also offer drinks on their mini bar that can satisfy your night depends on your mood. Last but not the least is the Casa del Rey that serves native dishes. If you're into the platter Filipino meals this one is for you. They have all sorts of Pinoy faves, the Pritong Tilapia, Pritong Manok, Nilasing na Hipon, Pritong Tanigge, Liempo at Gulay. From all the resto, CFA also have a Food Cart Area that serves ice cream, lemonades, pizza, fruit shakes, dimsum and dumpling, potato fries, Mexican food, Shawarma, Hotdog, Isaw, Nachos, Lugaw and so much more that you shouldn't miss as well. You should also drop by their bazaar just beside their parking lot. It has unique items other than the clothes, bags and shoes, they have paintings and vintage items as well. 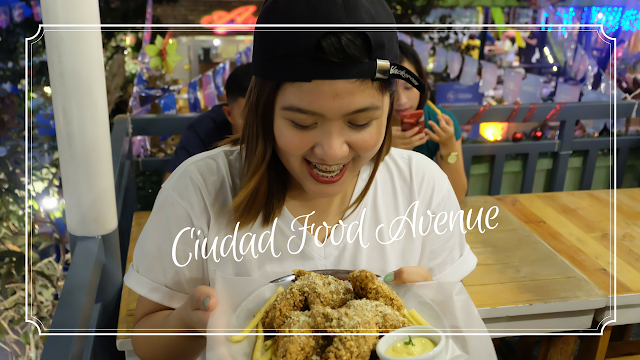 That is all of the Ciudad Food Avenue review. Its the dream food hub for the Batanguenyo like us. Visit now!